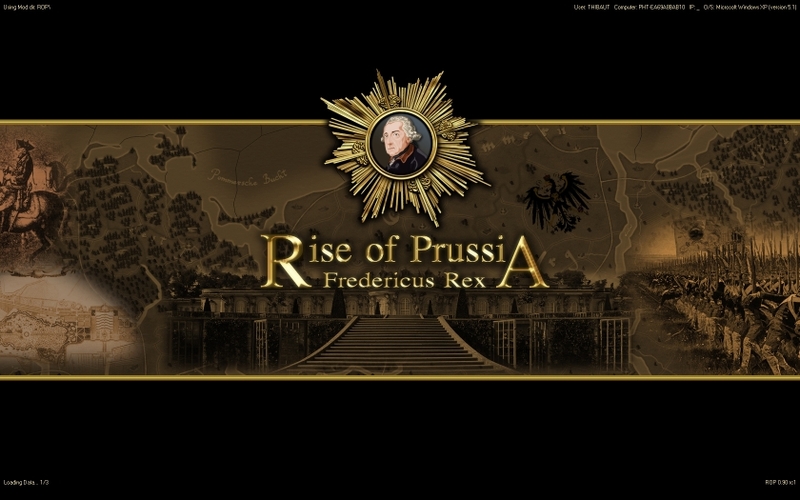 The Demo (v1.01a) of Rise of Prussia is now available here! (courtesy of Nexway France, our download provider here at AGEOD). And that's it, basically, almost as the full game within the context of the demo scenarios (and these limitations should not prevent you from enjoying the demo). Player of many Ageod Games : AACW, ROP, BOA2 and PON! After this i find first bug??? using 1280x1024 resolution in a 17 monitor find that the new feature to find armies and korps isnt in the right place, not in the extreme right. - atomic gamers mirror (Texas4) downloaded at 270kB (taking about 45 minutes). This was at 12:45 GMT, speeds may wel be the other way around during the US day. Hmm, that's sub-optimal, I say; we'll provide more download URLs when we have them. I am at 70%, wondering if I should switch to the new site - probably not worth it . This bug has not been spotted (and thanks in doing so) because you used an option (I believe, you'll confirm please) that few if any here are using: you used AGESettings to run the game in a resolution which is different from your desktop resolution, right? For now, to fix your problem, launch AGESettings and tell him to use your desktop resolution, and things should be in order. why? Because you don't want to play with your desktop resolution? Wonderful thing, dear fellows, I got your demo right now. Can you tell me if possible at which time after first release a full boxed version will be available?? I would prefer a boxed version versus a download version. Although I can buy the game at gamersgate I hope that it will be soon available from you as a boxed version, but I need also the info about a price about a boxed version. Will be the price for boxed version the same like the gamersgate version or will the price differ from that? Display owner filter, it is not as clearly dfferenciated the ownership as in NCP? In NCP it is resized vertically, here could be done in both axis with a pair of columns. But with so many elements probablly would be confusing. You are right, a mistake and oversight. Should be removed. Problem solved, now can start the game in other resolution without the fast access to armies bug. The demo has been updated Friday, March 5, at 13:50 GMT, and is now in version 1.01a (the previous one was in version 1.00). See first post for the permanent link. The third tutorial had a bug preventing the process of the first turn. Not using his desktop resolution would prevent the Army Outliner to be displayed correctly. In the campaign, the Saxony Surrender and Austrian Reinforcements events have been overhauled completely. I'm trying to move a prussian force from Pirna to Dippoldiswalde. There is a road between these two provinces but the game make me move through Mitteweida province containing mountains : move will take 25 days instead of the nine days with the direct way ! Edit : Game files are attached. Mickey3D wrote: I'm trying to move a prussian force from Pirna to Dippoldiswalde. I was unable to use your saved game, as we are now working on a later version of the database. The bug must be specific to some units and not to the map though, because doing some tests proved it is not easily reproducible (see image, everything is all right). If it surfaces again with the full game, be sure we will correct it though. Nice to see some people playing with the 3D units ! [CENTER]. : G P E P P E R : . Considering that in the demo you relase nearly everything, when will be available RoP databases? Pocus wrote: I was unable to use your saved game, as we are now working on a later version of the database. The bug must be specific to some units and not to the map though, because doing some tests proved it is not easily reproducible. Perhaps is it someting that happens only with snow as suggested by Nial here ? gpepper wrote: Nice to see some people playing with the 3D units ! Mickey3D wrote: Perhaps is it someting that happens only with snow as suggested by Nial here ? Yes, it only happens when there is snow on the ground. I have seen it in at least one other region besides the one shown as well.